The Insignia degli Anziani Consoli, bound in 16 volumes and housed in the Archivio di Stato Bologna, are documents on parchment. They were made every two months, from 1530 to 1796, to celebrate the eight Anziani Consoli and the Gonfaloniere di Giustizia, a group of magistrates ruling the city. From the end of the sixteenth-century, the names of the magistrates were depicted flanked by their coats of arms and a significant event that had taken place during the two months of their charge: an extraordinary visual chronicle illustrating more than two centuries of the city's history with six pictures a year. This picture (IV bimester of 1657) shows the stage for the roast pork feast. Celebrated every year on the 24th of August, a special installation was ssembled on the main square to host the feast of St. Bartholomew. 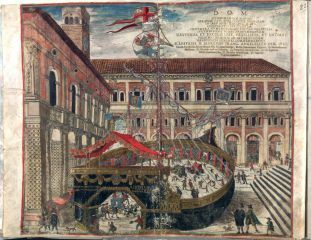 In 1657 the theatre was shaped as a ship and was occupying nearly all the square, between the palace of the Podestà on the left and the stairs of the basilica of St. Petronius on the right. Along the sides of the ship were the stalls for the feast of the Assumption (from 15th to 24th August) that were going to become on the 24th boxes for the paying audience watching a theatrical representation and taking part in the traditional distribution of roast pork. On the mast waves the flag of the Municipality, under it a standard shows the coats of arms of Pope Alexander VII among those of the cardinal legate and of the archbishop of Bologna. On the aft deck a tent hosts the nine coats of arms of the Anziani Consoli and the Gonfaloniere of the bimester July-August 1657. On top right a Latin inscription in golden ink describes the picture and bears the names of the Anziani Consoli. 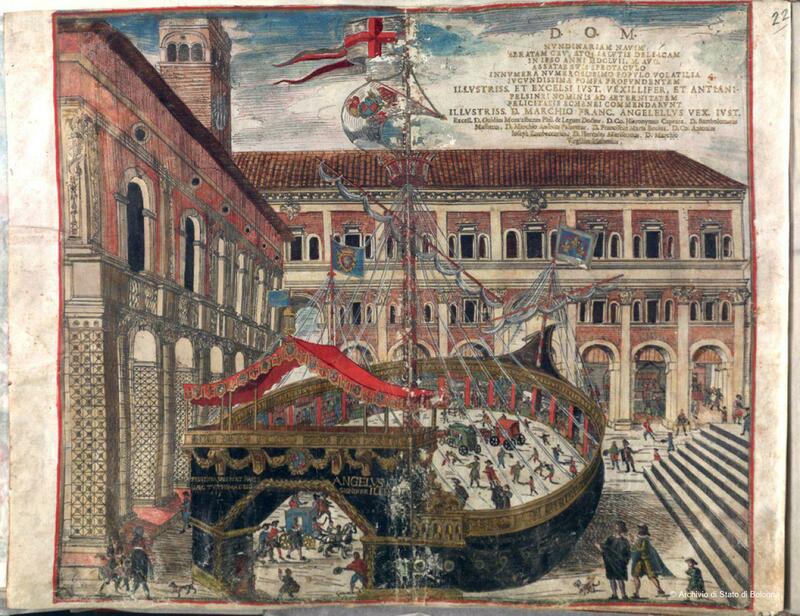 This illumination represents a theatre in the shape of a ship that was built on the Main Square of Bologna for the feast of the roast pork in August 1657. This was an event that attracted a great number of people every year. The ship sails are the coats of arms of the nine families of the Anziani Consoli and the Gonfaloniere, who ruled Bologna in the bi-mester July-August 1657. On the left side of the ship, is the portico of the Palazzo del Podesta. In the background is the Pavaglione and the Palazzo dei Banchi. The stairs on the right lead to the church of San Petronio. The date and the names of the magistrates are inscribed on the top right of the picture. This illumination, like the whole series, has always been housed in the archive of the Bolognese senate, inside the municipal palace. It was transferred to the Archivio di Stato in 1874, when it was created. Plessi, G. Le Insignia degli Anziani del Comune dal 1530 al 1796. Catalogo-Inventario, Rome, 1954. Il Magnifico apparato. Pubbliche funzioni, feste e giuochi bolognesi nel Settecento (exhibition catalogue) (ed. S. Camerini), Bologna, 1982. Matteucci, A. M. “La cultura dell'effimero a Bologna nel XVII secolo”, Barocco Romano e Barocco Italiano. Il teatro, l'effimero, l'allegoria (eds. M. Fagiolo and M. L. Madonna), Rome, 1985, pp. 159-173. Zanni Rosiello, I. “Le Insignia degli Anziani: un autoritratto celebrativo”, Società e storia: 52, 1991, pp. 329-362. Giansante, M. “Gerarchie e scenografie. La festa della porchetta nelle Insignia degli Anziani Consoli di Bologna”, I quaderni del M.AE.S. : 8, 2005, pp. 93-125. Graduated in Italian Modern Literature at the University of Bologna, PhD in Medieval History at the University of Torino. Professor of History of the institutions in the Middle Ages and Specialized Archivistics at the school of Archivistics, Paleography and Diplomatics of Bologna. He has written about Bolognese bankers in the age of the Comuni (2008, Il Mulino) and on the Liber Paradisus (in collaboration with A. Antonelli, 2008, Marsilio). He is a specialist in medieval documents and history didactic.